The beam is failed by the diagonal tension in which the cracks start from support and extend upto a distance equal to effective depth and making an angle more or less than 45 degrees. 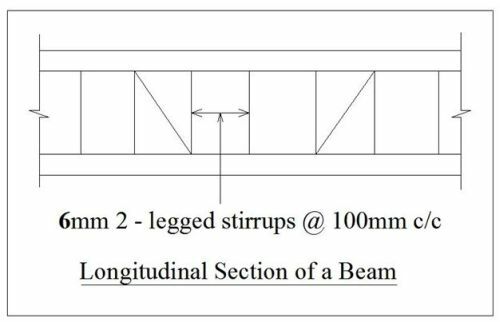 How to design a beam by knowing its end moments? i saw a building been constructed and it has been divided into 3 different sections with the provision of expansion joints .Why the expansion joint? Expansion joints can be used if the facades are huge. If the building is divided into three sections with the help of expansion joints, the cracks that occur due to heat induced expansion or contraction of various materials can be prevented. It also helps in absorption of vibrations. Expansion joints are not generally used in buildings, they are preferably used in bridges, sidewalks, railway tracks, piping systems etc. In case the building to be constructed is huge and falls in an earthquake prone zone, then expansion joints are used to prevent the structure from damage of vibrations. You steps for the design of Shear Reinforcement in a beam is really amazing. I am an engineering enthusiast and I am learning from this. Thanks. Hello. Thanks for writing this.